Elnora Louise Jack Garcia, 92, of Myrtle Beach, S.C., passed away on Saturday, November 24, 2018, at Reflections Assisted Living in Myrtle Beach. She was born June 2, 1926, in Moundsville, W.Va. to the late Freda Fogle Jack and the late James Edgar Jack. She was also preceded in death by her husband, Celso Garcia. Mrs. Garcia was a graduate of West Virginia University. She worked as a Registered Nurse and was a member of Mt. Hermon Baptist Church, Danville, Va.
Mrs. Garcia is survived by her daughter, Roseanna Gilreath (Dennis); her sons, Louis Stephan Garcia and Edward Lee Garcia; six grandchildren; and two great-grandchildren. 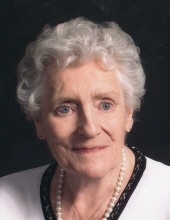 In addition to her husband and parents, she was predeceased by her brother, James Edgar Jack, Jr.
Funeral services will be held at 2 p.m. Wednesday, November 28, 2018, at Mt. Hermon Baptist Church, 4385 Franklin Turnpike, Danville, with Rev. Steve Chromy officiating. Interment will follow at Highland Burial Park. The family will receive friends Wednesday, Nov. 28, from 12:45 to 1:45 p.m. at Mt. Hermon Baptist Church prior to the service. Norris Funeral Services, Inc. & Crematory, Mt. Hermon Chapel, 3995 Franklin Tpke., Danville, Va. is respectfully serving the Garcia family. Online condolences may be made at www.norrisfuneral.com. To send flowers or a remembrance gift to the family of Elnora Louise Jack Garcia, please visit our Tribute Store. "Email Address" would like to share the life celebration of Elnora Louise Jack Garcia. Click on the "link" to go to share a favorite memory or leave a condolence message for the family.